Click here to donate to the Oregon Officers Reward Fund GoFundMe campaign. Reward: Up to $20,000 USD. Description: Hispanic male, 5’4″ tall, 140 pounds, with dark hair and brown eyes. As a result of the injuries he suffered in the crash, he is believed to have used a walker. 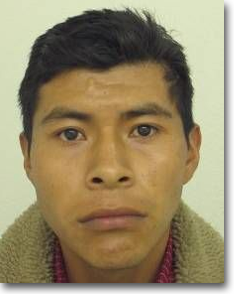 Last Known Whereabouts: De Jesus-Ascencio is believed to have fled to Mexico, but has ties to the Woodburn, OR area. Kelly James Fredinburg grew up in Salem, OR and had always dreamed of being a police officer. Kim Walsh, his sister, recalled how Fredinburg, as a youngster, would chase his two siblings around on a tricycle to arrest them. Kelly was a whiz with his Weber grill and meticulous when it came to his lawn. He was a joker, a loving father and husband, and a highly dedicated lawman. 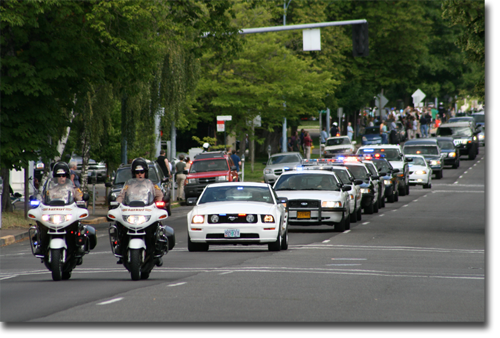 On June 21, 2007, more than 1,000 family, friends and enforcement officers from across the state descended on the Salem Armory for a memorial service to honor the late Marion County Sheriff’s Deputy. 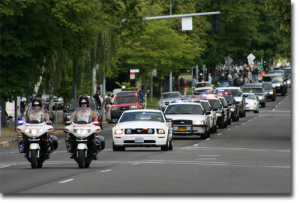 It was followed by a 10.5 mile long procession of almost 400 police and emergency vehicles that wound through the streets of Salem. Fredinburg became a reserve officer for the Polk County Sheriff’s Office in 1997. He spent six years there as a corrections and patrol deputy before being hired in Marion County’s North District in 2006. As most of Fredinburg’s professional career was in Polk County, area deputies and police provided many humorous and touching anecdotes about their fallen comrade. Some oft-repeated descriptions about Fredinburg included his “goofy smile” and relentless nature when it came to making warrant arrests. In his time with the Polk County Sheriff’s Office, Fredinburg shared a graveyard shift with officers in Monmouth and Independence, and frequently backed them up on calls. Monmouth officer Doni Hamilton said Fredinburg was known for donning a pair of black leather gloves – “that were so dirty and old, they looked brown” – whenever he was about to make an arrest. Lyle Gilbert and Nicholas Hunter of the Independence Police Department said Fredinburg relished pranking his peers and recalled how Fredinburg once panicked an officer by grilling him with a made-up traffic safety complaint. But when it was time to be serious, Fredinburg was quick to assist other police, Hunter said. Fredinburg’s name was be added to the fallen officer’s memorial at the Oregon Department of Public Safety Standards and Training. Fredinburg is survived by his wife, Christine, and two daughters, ages 12 and 3. On the evening of June 16th, 2007, the Marion County Sheriff’s Office received a call for backup to assist a Gervais Police Officer that was involved in a reported physical dispute. Deputy Kelly Fredinburg, a law enforcement veteran of nearly seven years, was en route to the call along with officers from the Woodburn and Hubbard Police Departments. Deputy Fredinburg was travelling south on Highway 99E near milepost 35 with his emergency lights and siren activated. According to Oregon State Police reports, at least one northbound vehicle began to pull onto the shoulder to yield to Deputy Fredinburg’s patrol car when a 1998 Ford Crown Victoria, also traveling north, crossed the center line into the southbound lane, crashing head-on with the deputy. Both vehicles came to rest off the west side of the highway, and the deputy’s car overturned and caught fire. 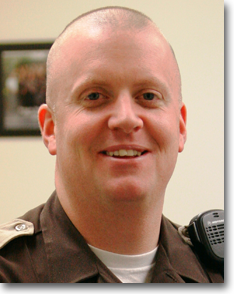 Deputy Fredinburg succumbed to his injuries and was pronounced dead at the scene. The driver of the Ford, Alfredo De Jesus-Ascencio, 20, of Woodburn, was seriously injured and transported by ambulance to Oregon Health Sciences University where he was listed in critical condition. De Jesus-Ascencio’s front passenger, 19-year old Oscar Ascencio Amaya of Woodburn, had to be extricated from the vehicle by fire personnel and was flown by LifeFlight to OHSU where he died the following morning. A third occupant riding in the rear seat of the Ford was given a ride to the hospital and was treated for non-life threatening injuries. De Jesus-Ascencio stayed at Oregon Health & Science University for several weeks to recuperate from his injuries. Oregon State Police investigated the crash for more than a month before it was able to provide results to the district attorney’s office to determine whether to pursue charges. Before they had finished, and before the grand jury could indict De Jesus-Ascencio on criminally negligent homicide charges, he was released from the hospital and disappeared. He still remains at large. 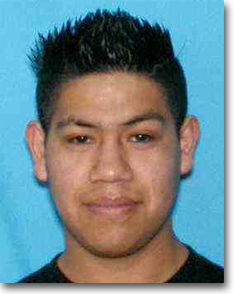 De Jesus-Ascencio was last known to be in the Woodburn area on August 9, 2007. Intelligence suggests he may be near Puacuaro, Michoacan, Mexico. Anyone who has information regarding the whereabouts of Alfredo De Jesus-Ascencio should immediately call the Oregon State Police at (800) 452-7888. Crimestoppers is offering an additional $1,000 dollar reward for information that leads to an arrest in the case. Residents within Mexico can call the Specialized Unit Against Crimes Committed Abroad (UEDE) at 0-1-555-346-1669. La información sobre el fondo de recompensa traducida al español. Copy of Oregon State Police Official Press Release.